We're not too proud to admit when we're flummoxed. The role reversal has got our head spinning. Instead of the "food" animal playing the part of the Edible Seductress—a reality we have, alas, grown familiar with—the pig almost appears to be calling the shots. 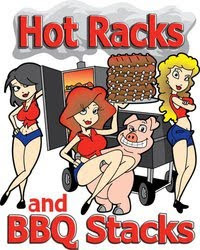 So complete is the upending of the long-standing belief system that the hackneyed double entendre (racks for ribs and breasts) here serves to degrade actual women and not sows or cows. Is this the day the animals have waited for? The day their shackles fall to the floor? The day the animals see their former superiors servile and scraping? Well, no. Let's not get carried away. The pig is merely exhibiting a new motivation for self-sacrifice. The barbekooks have told him of the sexual pleasures he will sample—with humans!—if he only signs here on the dotted line. Like a deal with the devil, this arrangement hardly works to the pig's favor. He'll end up just as dead as all the rest, they who were promised nothing more than death. Your blog is amazing. That's why I chose you for a "One Lovely Blog" award. See my blog for details. Keep up the great work. You're a genius!